The average person sees millions of TV commercials in a lifetime. Many start absorbing television ads before even forming words, so it comes as no surprise that this exposure can lay the groundwork for becoming a "TV Commercial Expert". Can this viewer expertise motivate you to become TV or web video commercial producer? Of course it can and this book is designed to help you do just that. Your mind is already trained to create video advertising. The foundation has been laid. We will now build on what you already know. 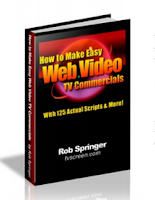 Throughout this book, I will share my own decades of experiences in both TV commercial production and internet marketing, and you will gain the ability to create effective web video TV commercials. I am assuming you want to start now, so I will cut to the chase and not overload you with information that you do not need to know at this point. Exploring the production process more deeply is a path you may choose to follow later. In just a few more paragraphs, you will find simple guidelines, approaches, ideas, tips, talent release and production forms, PLUS a huge BONUS: A directory of commercial scripts I've written. You are free to edit use them for your own projects. While may of the concepts of web video commercials lie in the realm of TV commercials, or focus here is making internet video content that successfully sells whatever you offer.